Today's trip to the park has seen all three children making progress on their cycling journey. 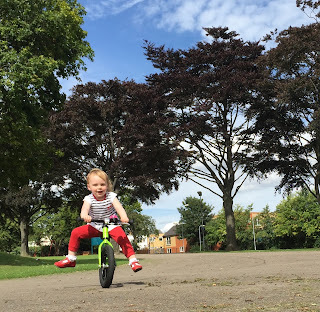 We started out by raising Ruth's seat, and she is now scooting with increasing confidence. I'm amazed how slow she can travel with both feet up in the air! 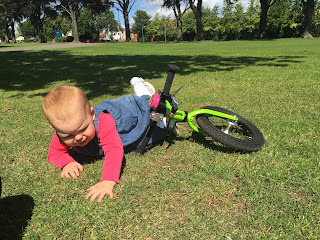 We do need her to cotton on to the idea of using her brakes before too long, or she will learn by the school of hard knocks. We're also going to have to speak to Islabikes about the long seatpost for the Rothan, because Ruth is now right up on the stop. Thomas Ivor, meantime, has been working on bike handling, taking the opportunity to use laps of the bandstand to practice the skills we want him to have at his disposal on the road, in comparative safety. Today we've done riding one-handed and looking behind whilst tracking in a straight line, leading to indicating left and right, which has gone well. 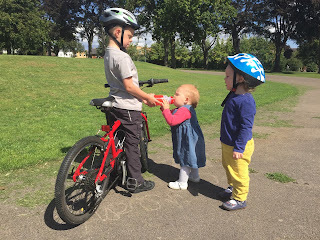 Until he's doing this as second nature he will rely on having one of us on his shoulder on the road, so this is an important, if mundane, rite of passage for him, which will lead to him becoming more independent. 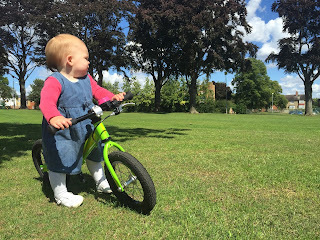 That's where the report might have ended, but sat in the rucksack on my shoulders as we did all this, a little girl kept insistently shouting "Bike!, Bike!". "Oh Dear! ", she pronounced, getting back to her feet without a fuss.